አሐቲ ተዋሕዶ AHATI TEWAHEDO: በእውነት የፓትርያርኩ ሥርዓት አልባ መሆነ እኛን ከእውነተኛ መንገድ እንድንወጣ አስተዋፆ አለውን? Rule is already broken . it is almost 18 years. as loong as EPdRF in power , Abbaw will stay for ever until he dye or ? Those independent or Geleltegna Churchs are among the worst place to practice religion.It's a lucrative and big buisness in western worlds.That's why U see a number of private owned churchs by different names all over the corners. The board members and those synthetic Abatoch who run the buisness don't care about the rules and regulation of ortohodox churche.As long as they get money(HODAM HULA!!!) they don't care about christianity .Of course some of the HODAMs are capable of getting pocket money to send their children to private school,paying personal morgage and to the extent building other private buisness.It's not only Abune Paulos who should be blamed at this point .We all should start questioning how those independent church people managing our money!! !Please ask where your money is whenever U go to Church.No More Silence!LEBA HULA!!! በጣም የሚገርመው ነገር የዚህ ብሎግ ባለቤት ማን ይሆን እያልኩ ራሴን እየጠየኩት ለነበረው ጥያቄ ጥሩ እና በቂ መልስ አገኘሁለት። ወንድሜ ሆይ ይህንን በማድረግህ ባላዝንብህም አዝኘልሀለሁ ደግሞም ታዝቤሀለሁ። ያልተናነጽበትንና ጉንጭ አልፋ የነበረውን ወሬያችንን እዚህ ላይ እንደ ደህና ነገር ቆጥረህ እዚህ ላይ ታወጣዋጣዋለህ? በእውነቱ በጣም ያሳፍራል። የሚለጠፍ ነገር ጠፋ፤ አለቀብህ እንዴ? በትችል አንባቢወችህ ዋጋ ሰጥተው ሊያነቡትና ሊማሩበት የሚችሉበትን የተሳለ ነገር ብትለጥፍ የሚሳል ይመስለኛል። ብሎግህ ዋጋ ቢስ እንዳይሆንብህ እሰጋለሁ፤ በዚህ ከቀጠልክ(በጔዳው የተወራውን ሁሉ የምትለጥፍ ከሆነ) አይቀርልህም። ለእኔ ግን ጥሩ ትምህርት ሆነኝ ከማን ጋር ምን አይነት ወሬ ማውራት እንዳለብኝ። መቸም ለራስህ ብቻ አንብበህ እንደማታስቀረው ተስፋ አለኝ፤ ዳሩ ለጠፍከው አለጠፍከው ሁሉም አንድ ነው ለእኔ። እህህህም አሁንም ደግሜ እለዋለሁ በእውነቱ በጣም ነው የታዘብኩህ ለካስ ያለ ነገር አልነበረም እንደዛ ስታስለፈልፈኝ የነበረው! ስለእውነት ግን አንተ እንዳልከው አቋምህን ለማስቀየር አልነበረም ንግግራችን የተጀመረው፤ የጽሁፍህ ማጣፈጫ መሆኑ ነው እንዴ ይገርማል ወይ ጉድ እኛው እርስ በራሳችን ???? ከማን ጋር ይሆን ያለ አንዳች ስጋት የልብን ገልጦ ማውራት የሚቻለው???? አንደበታችንን ልንጠባበቅ?? በጣም ያሳዝናል። ወንድሜ ሆይ በነገር ሁሉ ጌታ ማስተዋሉን እንዲሰጥህ እመኝልሀለሁ። ሌላማ ምን እልሀለሁ??? ......I said the WIDEST, bcoz TEWAHIDO is the NARROWEST ROAD, which leads to Christos. እዚህ ያሉት አባቶች ስደታቸው ለቤተ ክርስቲያን ስላልሆነ ጉዳዩን የሚያዩት ለነሱ የሚጠቅም ነገር እንዳለው በአንክሮ ነው:: እነሱ በብልሃት ያልያዙትን ቤተ ክርስቲያንን ማጥፋት አባ ፓውሊ ሲያደርጉላቸው ሲያዩ፣ አሁን የሚመረምሩት እሳቸውም የታዘዙት ልክ እንደስደተኞቹ ( ተሃድሶዎቹ) ከአንድ ቦታ ነው ወይስ አይደለም ነው:: ከአንድ ቦታ ከሆነ እነሱ ሳያውቁት በላያቸው ላይ ሌላ አፍራሽ መቀጠሩ ለምንድን ነው እያሉ ነው የሚጨነቁት:: ለነሱ ዋናው ነገር ቤተ ክርስቲያናችንን ጠፍታ ማየት ነው:: ግን አትሞኙ እዚህ ኢሠታ ና ኢህአፓ የነበሩ ከሃዲዎችን ከነክህደታቸው አሳምነው፣ መናፍቃኑን ጳጳሳት ብለው ስለዘለቁ ሃሳባቸው የተሳካ እየመሰላቸው አንዳንድ ደካማዎችን ቢያወናብዱም ሊያውቁት የሚገባው "ቤተ ክርስቲያን የተመሰረተችው በክርስቶስ ደም በመሆኑ የሲኦል ደጆችም አይችሏትም ተብሎ ቃል ኪዳን የተሰጣት ስለሆነ አትፈርስም" እርግጥ ለነሱ ቆብ እና ቀሚስ አውልቀው በሱፍ እና በከረባት ካላስተማሩባት ትጠፋለች ለሚመስላቸው " ሱፍ እና ከረባት ሌባ ነው ትልልቆቹን ባንኮች እነ Bear Sterns , Leman Brothers and Maril Lynch የመሳሰሉትን ያጠፉ ናቸው:: ተስፋ ቁረጡ እናንተው ተላግታችሁ ትጠፋላችሁ እንጂ እርሷስ አትጠፋም:: ያከመሬት ሲዎድቅ አይዞህ መሬቱን ሰበርከው የተባለውን ህጻን ይመስላሉ እነሱ ስለከዱ ኃይማኖት ይጠፋል ብለው ያስባሉ:: የሚያሳዝኑት ተከታዮቻቸው ናቸው በፈቃዳቸው ማሰቢያ ህሊናቸውን እንዲጫወቱበት የፈቀዱት:: የሚያሳዝነው እንዳው ዝም ብለው ሬሳቸውን ያርቃሉ " ከአገር"
ለነገሩማ አባ ጳውሎስ እንዲመረጡ ታላቁን ሚና የተጫወቱትና ""እንደሳቸው ያለ ፓትርያርክ ተመርጦ አያውቅም "" እያሉ ሲያወድሷቸው የነበሩትስ እሳቸው አልነበሩ ? ታዲያ እንደነዚህ ያሉ : በቤተ ክርስቲያኗ ላይ እንደ መዥገር ተጣብቀው ያሉ ጳጳሳት ባሉበት እና እንደ ናቡከደነጾር ዓይነት የአሕዛብ ጠባይ ባለው ፓትርያርክ የሚመራ ሲኖዶስ እንዴት ሆኖ ነው እውነተኛ ብለን የምንከራከርለት ?? እርስ በርሳችን እየተጨቃጨቅን : እግዚአብሔርስ እንዴት አድርጎ ጸሎታችንን ይስማን ? There is NO geleltegna church except not mentioning Aba Paulos's name.So called under Synod are also registered assets of 'Tigray Development Association. 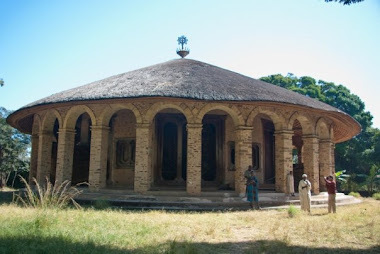 'Except NEW YORK SILASSIE, there is no church registered under EOTC.As to the services it is the so called 'Geleltegna'that follow and conduct absolutely Tewahedo's cannon in mass service,matrimony,christening,hymn service,etc.So Abel DO NOT DIVIDE US as if these churches are different.Believe it or not,these churches, where 90% of Tewahedo's faithfuls go,will not mention Aba Paulos's name ever.But they are all Tewahedo's churches!Mentioning his name does not make the churches undr Synod and vice versa. What do you want these churches do to become under the Synod that those who claim to be so are doing? I am sur you do not have answer.you just try to look pro one church,so are we.